Tastebuds.fm is an ingenious dating site that pairs people up based on their musical preferences. There's someone else on this planet who shares your affinity for Bjork, Garth Brooks, and Sonic Youth? Bingo. But now, with all this music-based dating info, the site is able to make some pretty keen generalizations about how the stuff you like affects, well, other stuff you like. 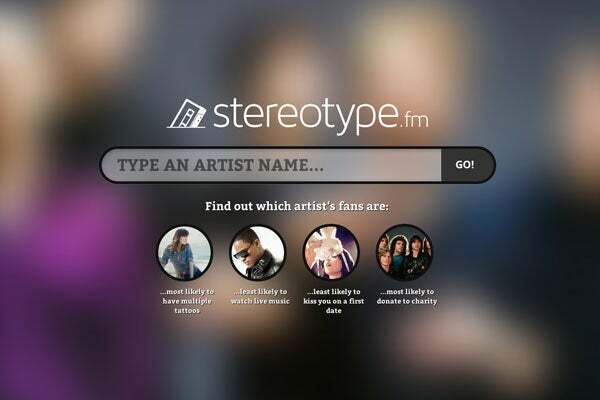 By cross-referencing information, Tastebuds.fm spin-off Stereotype.fm manages to make hilarious, if not totally inaccurate, statements about what your musical taste may say about the way you live your life. For example, if you are obsessed with The Game, you are more than likely to be skeptical that anybody's ever actually landed on the moon. If you are jamming out to One Direction, you've probably dabbled in some cross-dressing. (Shocking, right?) And fans of both Whitney Houston and Canadian shock-rocker Peaches have a penchant for filming themselves doing something "naughty." Head on over to the site and check it out. Unless, of course, you are a Wavves fan, because then that means you are probably a Debbie-downer about everything. Sorry about that.